THE funeral of Worthing grandfather Don Lock is to be a celebration of his life. 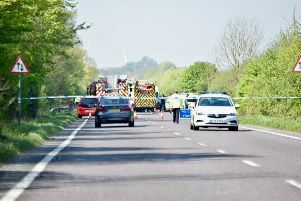 Don, 79, was tragically stabbed to death, after he was involved in a minor road accident on the A24 at Findon. A long-standing member of the Worthing Excelsior Cycling Club, Don was returning home from a club gathering when the incident happened. He will be laid to rest at a service for family and close friends at Worthing Crematorium at 3pm, on Wednesday, August 12. Any cyclists who wish to join the funeral procession on their bikes are asked to meet at Broadwater Green in Worthing at 2pm, before leaving for the crematorium at 2.30pm. It is predicted that because a large number of people could assemble at the green, there could be some traffic disruption in Broadwater Street West, South Farm Road and at the Grove Lodge roundabout on the A27.